RIO GRANDE — Bobbi Montgomery is the newest member of the Rio Grande Community College Board of Trustees. Montgomery is from Jackson, but spent most of her growing-up years in southern Louisiana. She began her career at a manufacturing firm based in Columbus where she was promoted to Comptroller at 19 years old. While working full-time, Montgomery attended Ohio State University and served as treasurer for the student government. Montgomery returned to southeastern Ohio in 1996 to join her family’s business, Montgomery Machine & Fabrication, Inc., in Jackson. Devoted to developing the workforce, she became involved in the community by serving on local, regional and state boards for workforce, community and youth development. Montgomery is a co-founder of LAUNCH Inc., a nationally recognized youth development organization that brought in over $1 million of grant funding to serve her local community. Rio Grande President Dr. Michelle Johnston said she is excited to have someone so dedicated to the community on the board. Montgomery has also served as chair of the Jackson County Economic Development Board and as an executive member of the Joint Economic Development Initiative of Southern Ohio. Montgomery said she is excited to join the board of trustees because, as a former part-time student at Rio Grande Community College, she knows the value the school adds to the education of the community’s students. “I am very excited to be a part of the board. Education is the key to enhancing the economy of southeastern Ohio because, without a skilled work force, we cannot grow our current businesses or attract new ones. We are very fortunate to have Rio in our community and I look forward to being a part of the exciting things Dr. Johnston and her staff are doing to grow this unique education institution.” Montgomery said. Montgomery lives in Jackson with her husband, Jim Siders, and their two children, Abigail and Harrison. 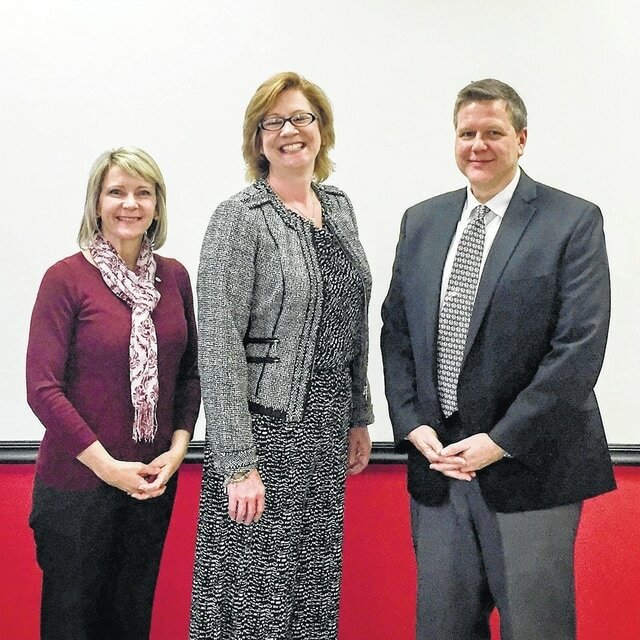 University of Rio Grande President Dr. Michelle Johnston, left, and Larry Kidd, chair of the Rio Grande Community College Board of Trustees, welcome Bobbi Montgomery to the board.